One of the hottest topics in the Weight Watchers groups seems to be low point alternatives for foods like potatoes, pasta, etc. 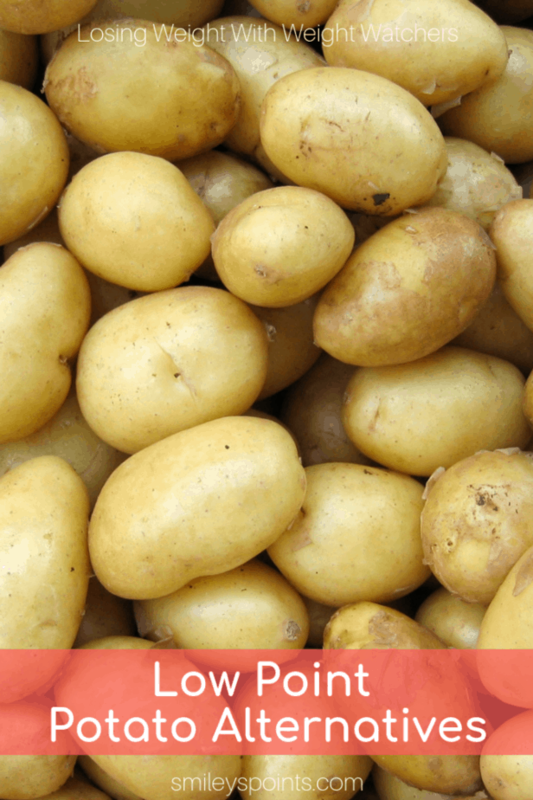 I love Weight Watchers because I can still eat the pasta and potatoes, but sometimes I go a bit overboard so we are going to talk about low point potato alternatives just in case you’re anything like me! I’m by no means saying give up potatoes, I’m just saying if you don’t have the points to spare and have a craving, here are some ideas. Potatoes are roughly 5 points. Carb Smart Potatoes are still potatoes, but a small one is only 2 points. Sweet potatoes are the same points as white potatoes so why do I mention them here? According to the research done at the Cleveland Clinic, sweet potatoes are a lot better overall for weight loss and health. Squash, cauliflower, and sweet potatoes are tasty, healthy potato alternatives to eat and keep your points low. Some other alternatives are roasted butternut, acorn, kabocha, and spaghetti squash. These awesome squashes can be made a lot of different ways to spice up a meal, add some texture and color to a dish and are a healthy alternative to just potatoes. For the record, I love potatoes! But I have a goal to meet and I will stay strong and achieve my goals just as you will. I like substituting for potatoes and still enjoying my meals. Every now and then I just have to have a potato so I get those delicious Carb Smart yellow potatoes and my craving is satisfied. Radishes may seem bit weird as a potato substitute but try this quick and easy recipe and tell me what you think in the comments. I half them, toss with a little oil, salt, garlic powder, smoked paprika (whatever spices you would use for potatoes) then roast like you would potatoes. 400 degrees, 20 min. Flip half way then I just check on them. Stick a fork in and if it slides off they are done. It really takes away that “radish” taste. They are juicier that potatoes but I find they are an excellent replacement. Pumpkin (cooked like spaghetti squash) is delicious and filling. If you don’t like pumpkin, use a squash you like and season it the same way you would a potato and enjoy. Beans are a great source of protein and are a staple for losing weight and staying healthy. Turnips are interesting because you can eat the turnip itself as well as the green leafy part. Turnips can be boiled or baked and the greens can be cooked and seasoned to taste or used in a salad, and at 0 points this category is a gold mine of filling alternatives that will help you get to your goal weight and beyond. Yes that is right, potatoes! As I mentioned earlier, sometimes you just want a good baked potato or some air fried french fries, or even some fluffy mashed potatoes. Yum! A 1/2 cup of Idahoan instant potatoes that you just add water to is 4 Points and regular potatoes are 1 point per ounce. Enjoy them moderately and count your points. When you decide to eat an alternative or the real thing use better toppings such as nonfat greek yogurt to keep the points as low as possible and still enjoy your meal. MMmmm hummus… A 0 point snack and a yummy one at that, but let’s use the chickpeas in a different way to get some of that roasted potato texture. 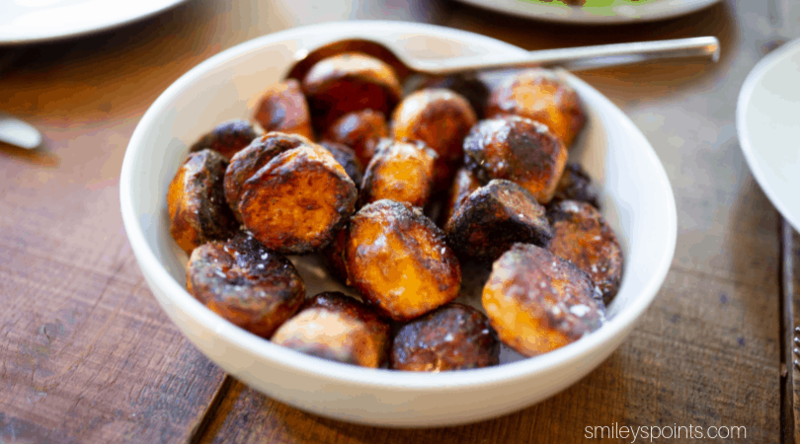 Check out this delicious roasted chickpea recipe from Slap Dash Mom for a low point potato alternative that will have your family begging for more. One last thought: adding protein to your meals helps to boost your metabolism and helps you to feel full for longer periods of time. Protein is an important building block of bones, muscles, cartilage, skin, and blood as well. Using high protein options in place of potatoes will save you points and keep you full longer. Learn how to add protein to your diet.